China is a country where everything reaches colossal dimensions, whether it is the population figure or the economy. The tourism sector certainly isn’t short of suggestions either, making it really quite difficult to choose just a few places to visit during your trip to China. The past thousand years has produced wonders such as the temples of Beijing and the Great Wall, in stark contrast with the presence of emblematic Communist symbols such as Tiananmen Square. Across the length and breadth of the country, you can feel the contrast between the ultimate modernity of Shanghai and the medieval feel of the Terracotta Army of Xi’an. 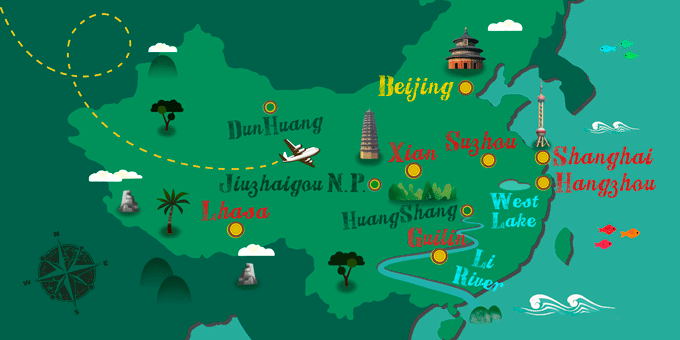 A vacation package to China exposes a thousand-sided diamond of ethnicities and cultures. Surprises are guaranteed. A visa is required to enter the country. Issued by the embassy or consulate. Price approximately $50.